LORD Is Directing Us to Do! The waters are receding and it's time to get dirty for Jesus! We've been asked by Pastor George and his leadership to come alongside of them and the fellowship at The Gathering in Baytown, TX! We've been asked to oversee all of the relief/recovery efforts for them. We're ready to start scheduling teams. The Bible tells us to work as though working for God and not for man. We also see that our God is an orderly God. Our heart as we serve the Lord in disaster relief is to keep these principles- working as unto the Lord in an orderly manner- in the forefront of what we do. Pastor Brian, who spoke at CC Chattanooga this weekend, gave us quite a timely message on serving The LORD! One of the things he said was that just because something is unified doesn't mean it is a unity from The LORD or a Godly unity! While disaster brings a lot of chaos, we try to do our part to remove as much of the chaos as we can--it's what we like to call having organized chaos--by having plans and procedures in place. 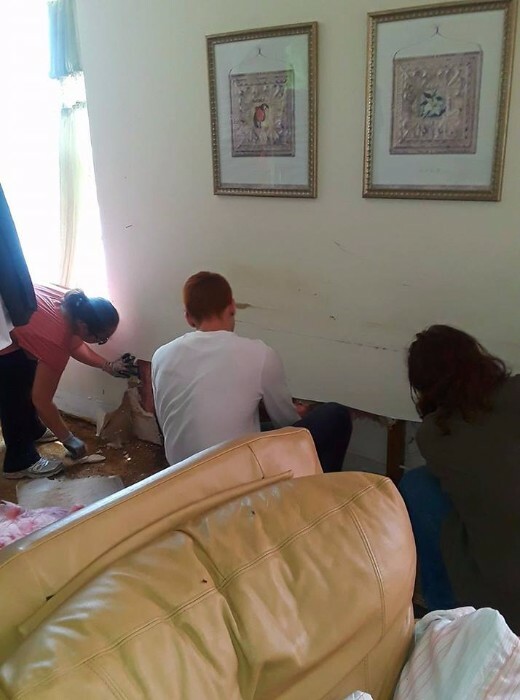 Mary Jo and I have been doing disaster relief for over 13 years and during this time, The LORD has shown us a lot about ourselves, His people, disaster relief, and how we believe He wants us to oversee His ministry. It is imperative that we are not only all on the same page about being Jesus' hands and feet to those affected by disaster, but also we must all be in unity with how that is done. We are looking for people with servant-hearts ready to do whatever is asked to come join us to bring true relief and hope of Jesus to people who are hurting. Come ready to learn and grow and be challenged in your walk with the LORD as well. If you wish to join us click here for more info. There is a document that must be read, agreed to and signed by EVERY person who wishes to join us. When you reach out to us to POTENTIALLY join us in Baytown, remember this is a request to serve with Calvary Relief and we will get back to you with the who, what, where, when's, etc. Do not just assume you can come!! We do not have any age restrictions to serve. We love seeing families serve The LORD together and have been blessed to find something to do for everyone who has joined us from toddlers to folks who were close to 90! We are open to youth groups, but they must be accompanied by adults/leaders (parents of youth do not need to be present). We require liability releases to be signed by anyone showing up to serve for a minute or a month. Anyone not accompanied by their parents must have this and all other forms filled out, signed by parents (liability release must be notarized), and received by us before arrival. If you have any questions, please feel free to contact us back. Remember, we are really, really busy and our ministry consists of 2 full-timers: me and Mary Jo. We will get back to you so please be patient. Emails only please. Please keep us in your prayers. If you wish to help with Calvary Relief's expenses you can click the link below.